This sophisticated coastal home built by Paradigm Constructions on Injidup Springs Road impressed judges with its flawless execution. The design signed by internationally renowned architect CEO and founder Javier Barba of BC Estudio Architects . The personal and powerful design to the project blends perfectly with the landscape of the Indian Ocean. 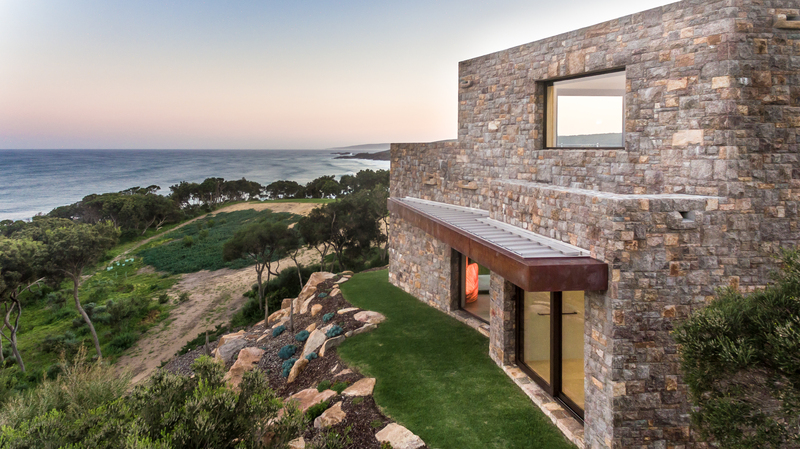 The home was sculpted from off-form concrete and stone and designed to visually cascade down the beachside site while ensuring its occupants remained protected from the region’s prevalent winds. a natural forest beside a long beach of great beauty. service area; the parking pergola and the studio upstairs. the living-dining area and kitchen, the master suite and bedrooms of daughters. As an extension of the kitchen and dining room, a porch with barbecue and a fireplace prolongs the life of the family to the outside. A few steps below, another porch, the guests and the swimming pool area are touched again with the natural landscape. On the lower level are located, a wine cellar, the service and garage. The detailed design of the rooms stands out in this project according to requirements andactivities of each of the family members. In the entry hall, a large window frames the panoramic ocean vistas, which can also be enjoyed from the free-flowing living/dining/kitchen space, master suite and minor bedrooms. Descending a few steps, there is views of the Indian Ocean. Next Birdwatching and Glamping in The Delta del Ebro.